McMurphy contrives to serve a short sentence in a state mental institution rather than serve time in prison on a work farm. The cost of this decision becomes apparent as he challenges the dictatorship of Nurse Ratched. While this starts as a sport, it soon turns to a grim struggle; an all-out war between authority and free will. The play, based on the 1962 novel, shows how the lives of both patients and staff are changed forever as they are caught in the tug of war between these two strong-willed characters. “Last night was one of the best if not THE best show I have seen at CSP. Brian casted so perfectly. Great acting and directing. And….You were superb. 👍” – Marylin P.
“It was AMAZING!!! I want to see it again!!! Thank you for such a great production!” – Stephanie C​. “This was an excellent show. This is the most talented group of people I’ve seen put together in one single show. Great job guys!” – Colleen B. “Such incredible writing and the actors really did it justice! Every single one.” – Rebecca C​. “Great performance! Was blown away by the first scene of Act I – what a presence!” – Donna B. “Last night, One Flew Over the Cuckoo’s Nest was outstanding……Each actor had my full attention. 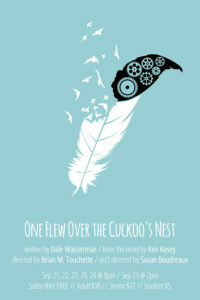 Congratulations and thank you for your talent and commitment.” – Jean N.
“The performance of One Flew Over the Cuckoo’s Nest was absolutely fabulous!! !” – Nancy C.
“Great show! !” – Kirsten B. * This production contains mature language and situations.